Twenty-six years ago this week, six Americans were killed and more than 1,000 injured in the 1993 terrorist attack on the World Trade Center. The anniversary of the attack receives little attention compared to its deadlier follow-up on 9/11, and references to the first bombing almost never acknowledge the role poor immigration enforcement and policies played in making the attack possible. All of the terrorists responsible for the truck bombing were either illegal aliens at the time of or prior to the attack. Each terrorist's immigration background provides an example of why immigration laws and enforcement of those laws are critical to the safety and security of American citizens, and how little has changed in more than a quarter of a century. 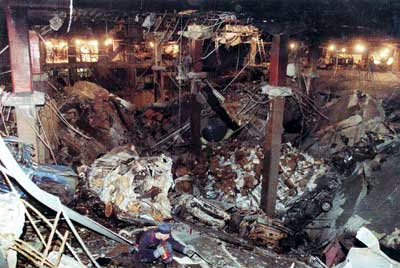 Ramzi Yousef, the mastermind of the 1993 attack, claimed asylum after entering the country with a fake passport and without a valid visa. Due to a lack of detention space, he was paroled into the U.S. and trusted to return on his assigned court date. Today a "Ramzi Yousef" would also likely be paroled. The recently passed spending bill reduced the number of detention beds even though ICE begged for more, saying that it is forced to release criminal aliens into our communities due to lack of space. Aliens actually abscond from court more often today than they did before 9/11. The only way to ensure that illegal aliens actually appear in immigration proceedings is to hold them. Eyad Ismoil, the driver of the van carrying the explosives, was a visa overstayer. He entered the country on a student visa, but he only took classes for three semesters before he joined the illegal population and began working. Between one-third and one-half of the 11 million or so illegal aliens in the U.S. are believed to be overstayers and, according to the most recent DHS study of overstayers, foreign students have an overstay rate twice as high as nonimmigrant visa-holders generally. DHS now has a foreign-student tracking system to alert immigration authorities to aliens who do not show up for or drop out of their academic or exchange program, but fraud and enforcement remain a large problem. If an "Eyad Ismoil" were to arrive as a student today, he would likely be able to disappear into the illegal population, just as this terrorist did and, of course, without mandatory E-Verify he would also more easily be able to work illegally. Mahmud Abouhalima entered the United States on a tourist visa in 1985 and overstayed to join the country's illegal alien workforce. His employer clearly did not use any employer verification program and, even more importantly, there was no entry-exit tracking system. Today, despite Congress mandating it multiple times, there is still no entry-exit system to identify overstays. Thanks to a lack of vetting of those applying for an amnesty under the 1986 Immigration Reform and Control Act (IRCA), he was approved despite falsely claiming to be an agricultural worker. Once he had permanent residence, he was able to leave the United States and travel to Pakistan for training by al Qaeda. Mohammed Salameh rented the truck used in the attack. He was issued a tourist visa in Jordan in 1988. His visa should never have been approved as he fit the description of someone likely to overstay — a single young man, with little income, no property, and limited roots. He overstayed his visa and applied for amnesty fraudulently claiming to be an agricultural worker. Unlike Abouhalima, Salameh's amnesty application was rejected, but he was not removed, so he was free to continue his anti-American work. Today a "Mohammed Salameh" would find similar opportunities — exposing a desperate need for interior enforcement to hold overstayers accountable and a need for better visa screening policies. Ahmad Ajaj arrived in New York from Pakistan with multiple passports, bomb-making manuals, and letters referencing his attendance at terrorist training camps. He was arrested and spent six months in prison before being released, at which time he was not handed over to immigration authorities for removal. Later it was discovered that he had continued to assist in the WTC bombing plans while incarcerated. Today, criminal aliens still often serve time in prison, then are released into our communities rather than being deported. Terrorists can still exploit our system today in the same way the WTC terrorists did in 1993. Congress continues to talk about the huge overstay numbers, "catch and release", poor removal numbers, widespread fraud, a lack of worksite enforcement and an entry-exit system, and the need for a mandatory E-Verify requirement. So the 26th anniversary of the death of six U.S. citizens is a good time to reflect on the fact that three of the seven 1993 terrorists were or had been visa overstayers, one was released on parole after entering illegally, and four were employed illegally. One was jailed, but then not removed. It is just a matter of time before more Americans pay the price for inaction by Congress.